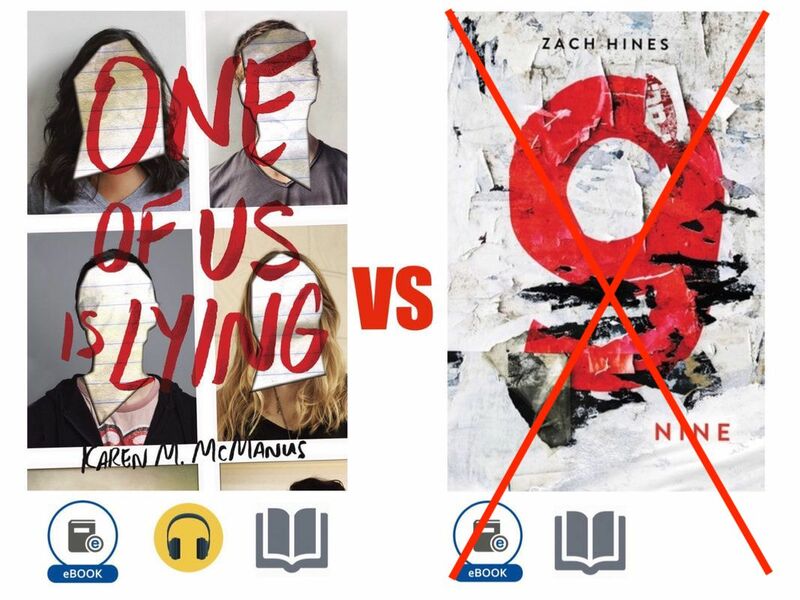 These are your favorite books of the 2018-2019 school year. 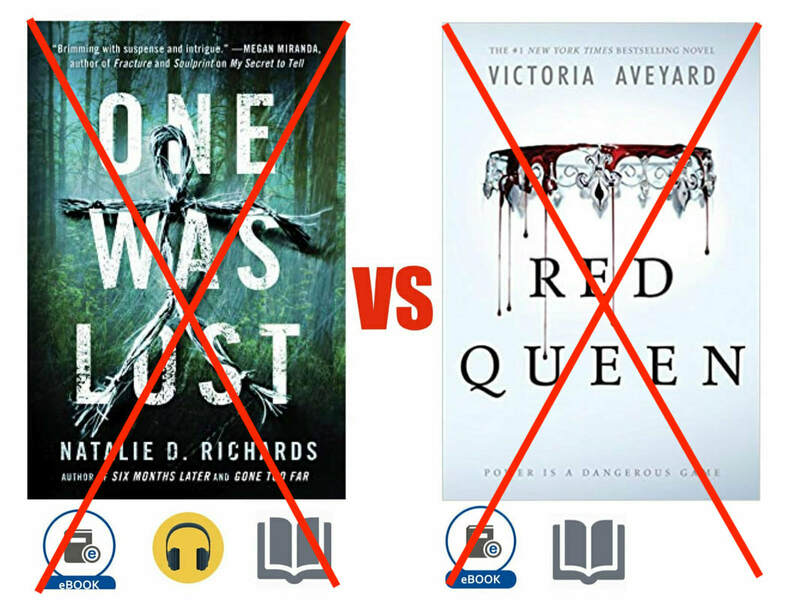 ​Vote for your favorites- the books you've read or want to read next! 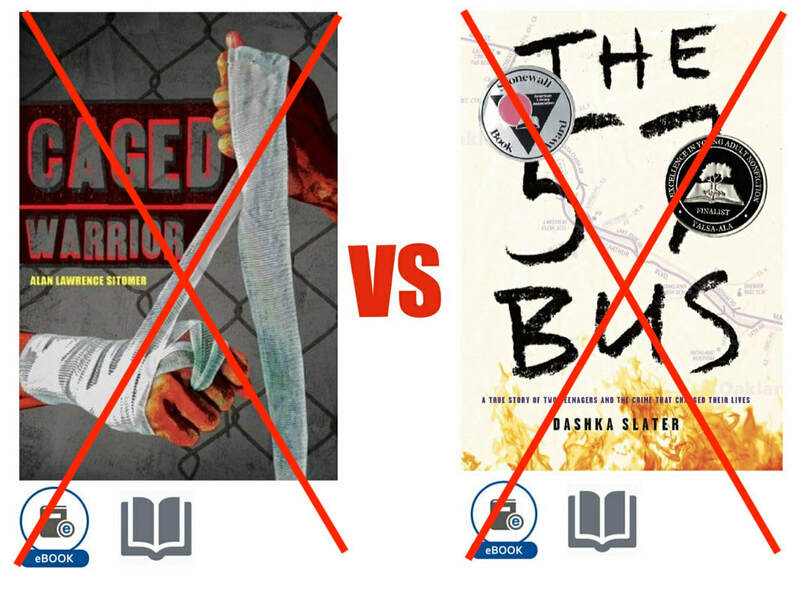 Return and vote for each round: Sweet 16, Elite 8, Final 4 and the Championship! Bronwyn the brain, is Yale-bound and never breaks a rule. Nate, the criminal, is on probation for dealing. Simon, the outcast, is creator of the school's popular gossip app. Simon never makes it out alive and they're all suspects. Nine by Zach Hines - In an alternate, near future world, humans have nine lives and society is structured around burning through lives. The government insists that as a means of controlling population, people must extinguish themselves at regular intervals and record the number of remaining lives in the form of a tattoo. Julien simply wants to extend his first life far beyond the norm and he becomes caught between the government and his substantiated fears. Long Way Down by Jason Reynolds - Will's big brother has been shot and he's compelled to seek revenge. On an elevator ride down, at each floor a different person visits him from the dead and tells his story. What will Will do? 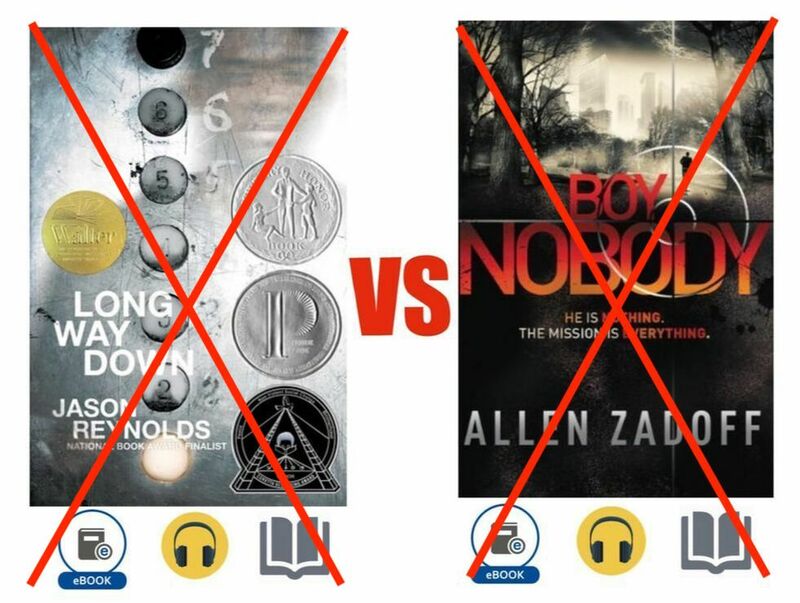 Boy Nobody by Alan Zadoff - Always the new kid in school, Boy Nobody is a trained government assassin who begins to question his role and his prior life once assigned to murder the mayor of New York City. 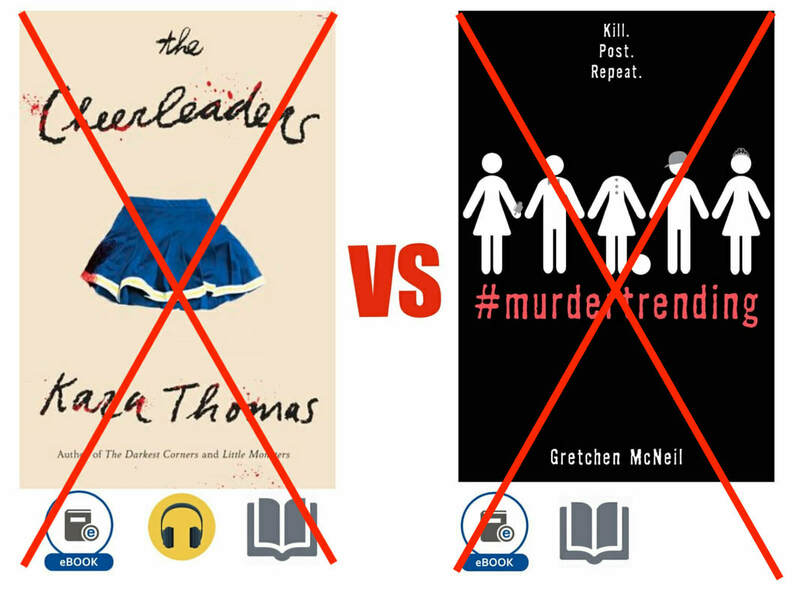 The Cheerleaders by Kara Thomas - Five years ago, five cheerleaders died in three tragically different ways and Monica, who lost her sister, seeks answers. What she finds is people harboring secrets and a potential cover-up. Is anyone safe? The Crossover by Kwame Alexander - Twins, Josh and Jordan are brothers, best-friends and basketball stars. One dives into rapping and another brother finds a girl in this action packed, fast paced novel in verse. 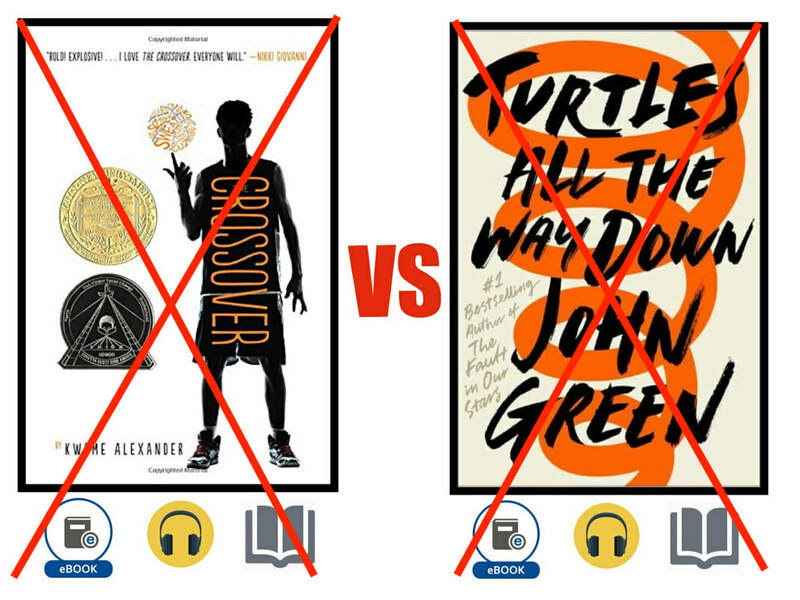 Turtles All the Way Down by John Green - "Aza is trying. She is trying to be a good daughter, a good friend, a good student, and maybe even a good detective, while also living within the ever-tightening spiral of her own thoughts." 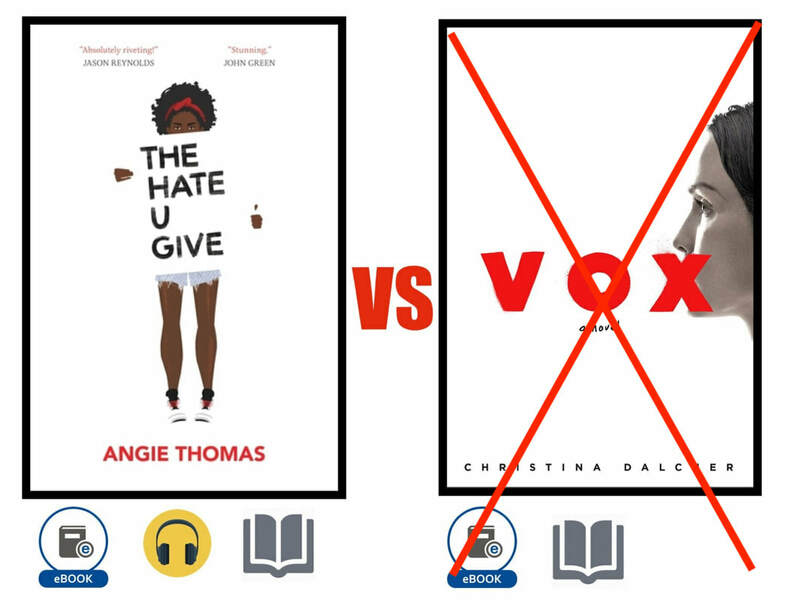 The Hate U Give by Angie Thomas - Starr Carter moves between two worlds: the poor neighborhood where she lives and the private prep school she attends. When she becomes the sole witness to the murder of her unarmed childhood friend by police, she is confronted with difficult choices. Vox by Christina Dalcher - In this dystopian America, women can speak only 100 words per day before being painfully shocked and they are forced to abandon their jobs. ​ Will a resistance rise up? Caged Warrior by Alan Lawrence Sitomer - McCutheon Daniels leads a difficult life in the violent and bloody Mixed Martial Arts ring, at home and at school. He struggles to survive and hopes to escape. Dear Martin by Nic Stone - Justyce McAllister is an honor student who just went to help a friend, but the police are uninterested in those details and arrest him anyway. Seeking answers to this incident and others, he looks to the teachings of Dr. Martin Luther King, Jr. when he finds himself in the middle of a media frenzy. 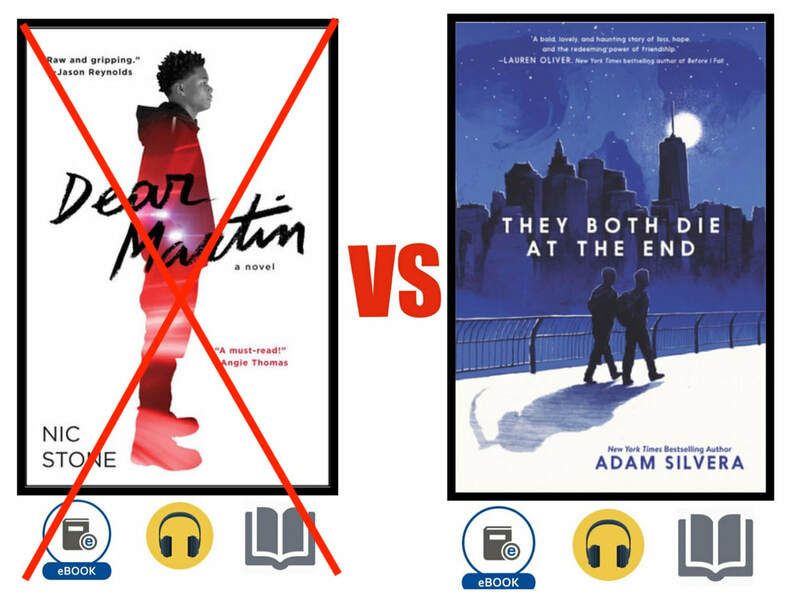 They Both Die at the End by Adam Silvera - At a little after midnight, Death-Cast calls two strangers, Mateo Torrez and Rufus Emeterio to get some bad news: They're going to die today. They're both looking for a friend on their End Day and look to the app, Last Friend. They meet-up for one memorable last day. One Was Lost by Natalie D. Richards - A school hiking trip through the West Virginia woods is mandatory for graduating seniors. This trip turns deadly when two groups of students become trapped on either side of a river. Someone is targeting them as they sleep. They awake to single words written in sharpie on their wrist: damaged, deceptive, darling. What does it mean? Who is out to get them? Red Queen by Victoria Aveyard - Mare's world is divided by blood. The Red serve the Silver-blooded elite who are gifted with superhuman abilities. Mare is a a red and a thief who finds herself in front of the Silver court where her superhuman power is put on display. Forced into pretending she is a lost princess, she works to secretly support the Red rebellion in an action-packed dystopian world. *This summary was created by the publisher of the book.